Providing occupational therapy (OT) in a deployed environment can be demanding, but the opportunity to provide rehabilitative care for fellow Service Members in a combat theater, although momentous, far outweighs any challenge. Throughout 15 years of conflicts in Iraq and Afghanistan, deployed military occupational therapists (OTs) conducted rehab missions in austere environments, performed therapy in fast-paced nontraditional clinical settings, and adjusted to and overcome provider burnout. This chapter highlights firsthand experiences from OTs who deployed with Army behavioral health (BH) units. Deployed OTs primarily worked in secure locations performing routine rehab missions according to doctrine and training. A few shared their experiences that did not proceed as planned. Risk and challenges exist for everyone over the duration of a deployment, which requires perseverance, prudence, and courage. 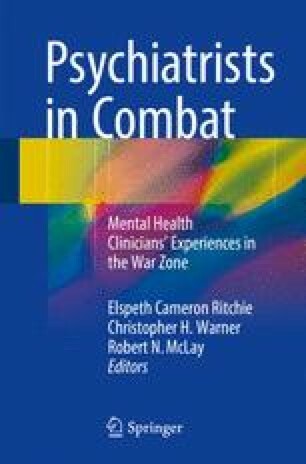 Some of the unique missions, circumstances, and challenges experienced by occupational therapists during the last decade and a half (2001–2016) in support of OEF and OIF are demonstrated in this chapter by personal, firsthand accounts. Arriving in country just past midnight; it had been a hot, sweaty flight on a C-130 from Kuwait. We were bussed to the temporary sleeping arrangements on the Forward Operating Base (FOB). Soon after falling fast asleep a loud overhead speaker announced ‘incoming, incoming, incoming!’ Jumping out of our beds and seeking cover; we waited in apprehension to hear the explosion … Instead we heard an ‘all clear, all clear, all clear.’ That night was the first of many uneasy sleeping nights. Without the contributions and sacrifices of Active Duty and Army Reserve OTs who courageously served in both Iraq and Afghanistan, this chapter would not have been written. More specifically, tremendous gratitude goes out to those who provided detailed accounts of their deployment experiences with COSC units the past 15 years. We would like to specifically thank LTC Enrique Smith-Forbes, LTC Arthur Yeager, CPT Francisco Rivera, MAJ Daniel Bash, MAJ Tammy Phipps, and CPT Jo Ann Zahn for their contributions. These accounts were essential to the formation of this chapter, and we hope that these stories generously passed along will help to formulate a perspective of the life of an OT before, during, and after a deployment. Disclosure: The views expressed in this chapter are those of the author(s) and do not reflect the official policy or position of the Uniformed Services University of the Health Sciences, Walter Reed National Military Medical Center, US Army Medical Command, US Army, Department of Defense, or the US Government. What is occupational therapy anyways? http://www.sensory-processing-disorder.com/what-is-occupational-therapy.html. Accessed 28 Sept 2015. McDaniel M. Occupational therapists before World War II (1917–1940); n.d. http://history.amedd.army.mil/corps/medical_spec/chapteriv.html. Accessed 1 Oct 2015. Major depression among adults; n.d. http://www.nimh.nih.gov/health/statistics/prevalence/major-depression-among-adults.shtml. Accessed 1 Oct 2015.